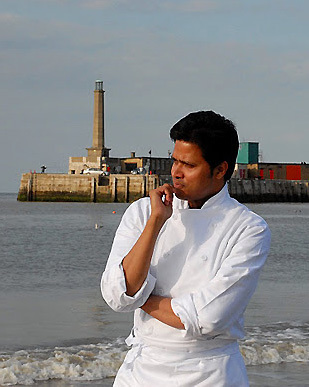 ON A VISIT TO MARGATE an opportunity to vist The Ambrette, an award-winning, Michelin-listed Indian restaurant with creative and inspiring chef-patron Dev Biswal at its helm, is just too irresistible. 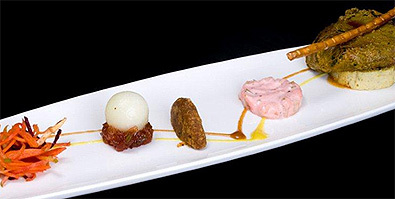 This is no ordinary Indian restaurant; indeed each dish is artistically created with such imagination and flair and is so delicately spiced so that diners will experience the true taste of each ingredient without being overwhelmed by intense flavours. We arrive half an hour earlier than our booking, to find others already seated in the restaurant. Nothing was too much trouble and the moment we walk through the door we are immediately made welcome by Faith, Sadie and Peter and shown to our table. From here on in, it just gets better and better. A non-alcoholic, fresh-tasting mango-based fruit drink appears. No sooner have we finished, a delicious little appetiser dish is placed in front of us: the most amazing Lentil Dumplings complete with a mini poppadum, melon ball and raita. This is an excellent sign of things to come. Dev is demonstrating his firm belief in the importance of keeping plenty of flavours, colours and textures on the plate so you never tire of the food and the taste. Not much chance of that, we protest. A slight pause and a tiny Lentil, Mustard and Lemon Soup with a Rice Dosa appears. Followed, with perfect timing, by our starters. There is never long to wait for another treat and, right on cue, come the most wonderful Crispy Pooris with sweet tamarind, chutney and yogurt  they are light, tasty and to die for. 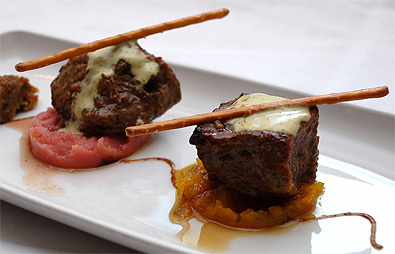 This food is full of exotic wonders; culinary art at its finest. We had both chosen Breast of British Chicken, an aromatic, delicious dish flavoured with spiced paneer, ginger, chillies, nutmeg, cloves and fresh coriander as our main course. Chicken so tasty and tender you wonder why it isn't always like that  gentle to eat with a zing that is not in the least overpowering. Dev draws his inspiration from the imperial kitchen of the Mughal Empire, which in turn was influenced by Persian and Turkish cuisines. His training has been in all styles of cuisine from South East Asian to European food and he works long and hard to find the right, complementary balance of flavours. A palate-cleansing Pineapple Grenita, sparkling with zesty flavours, is next; and by this time only one of us can eat a dessert: Chocolate Silk so light you could almost expect it to float off the spoon. As if by magic  or psychic intuition  Peter appears with a small spoon so that I can taste from my partner's plate. Out of this world. It is accompanied by the most fabulous mango ice cream you can imagine. Praise indeed from one who is not usually that keen on ice cream. Dev comes out from the kitchen from time to time to speak to diners but we resist the urge to engage him in lengthy conversation, although he assures us that all is under control in the kitchen. We are certain it is. The building that now houses The Ambrette is a former pub in Margate Old Town and has a great atmosphere. Dev has introduced such a wonderful ambiance here. As you would expect, the restaurant is very busy both at lunchtimes and in the evenings; so clearly many others have discovered and are enjoying this secret well ahead of us. Dev insists that there is nothing complicated about his philosophy of food. He begins with food in its simplicity, matching it to complementary flavours. In creating these flavours he keeps to natural ingredients; fresh, local and environmentally friendly. He designs the complete meal around his substantial knowledge and talent with food to keep the diner on an enjoyable and unbelievable journey of flavours. His experimental and very strong team is here in Margate and he inspires them with his enthusiasm; but he is also shortly to open another restaurant, in Rye. Dev's team is consistent and once everything has come together successfully that is the way it will be done, even for the next hundred years. Dev's life is cooking. He says it is all he has ever done  he lives, loves, breathes and dreams of food continually; he cannot imagine ever doing anything else. That, of course is the diner's gain. But Dev is a creative genius who is, in culinary and presentation terms, a great artist. It has taken almost a year to come up with The Ambrette's current menu. 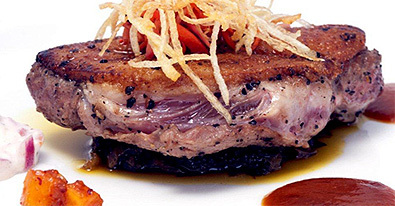 He and his team have created many dishes in that time but only five of them are available this time on the menu. We look forward to seeing more! Continually researching and experimenting with new ways of cooking and new ingredients, Dev keeps coming up with new ideas. 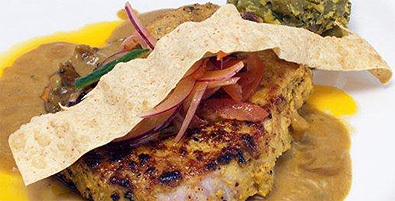 The concept of Indian food in this manner, taking regional Indian curries and introducing an innovative twist to take the diner to another level, is an absolute joy. Also available until next Autumn (2012), is a unique and exquisite ten-course aphrodisiac sampler menu, specially put together by Dev using ingredients known for positive effects on the libido! Not surprisingly, the Press has beaten a path to Dev's door. What is this brilliant restaurant doing tucked away in Margate?